I would order this 3 Tier Elephant Diaper Cake again. condition. Everyone at the shower loved it. Now she can put the diapers, blankets, and toy to use for the baby. Q:Is there additional specific information about diaper such a brand name? A:This diaper cake comes with generic diapers. Q:Will this cake arrive assembled? A:Yes, it will arrive assembled. 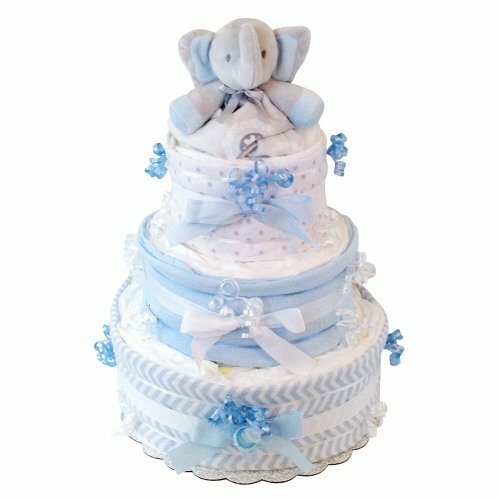 This adorable 3 tier elephant diaper cake makes not only a sweet but a practical gift too for any new mom or mommy-to-be. Handmade and extremely practical, this diaper cakes includes 100 disposable diapers, one elephant blanket, and three flannel receiving blankets. Perfect for keeping baby clean and comfortable. Makes a great baby shower or hospital gift.